A mysterious freighter from South Salem. This is one of Wayne Moyers excellent Copies of a wartime South Salem model. It is Number 2 from Wayne's list. This type was designated as "Modern Freighter, split Bridge" by South-Salem and represents the British and Canadian build "Park" and "Fort" type freighters. 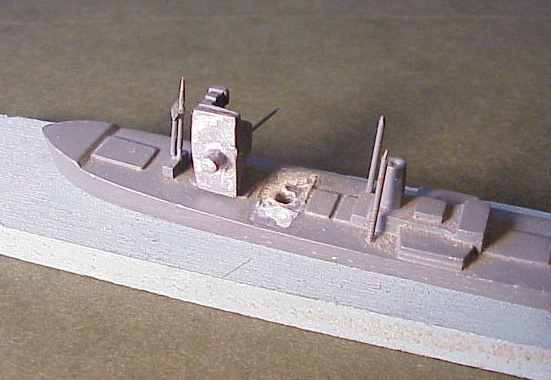 South Salem was one of the US wartime producers of 1/1200 ship models for identification-training purposes. Today, South Salem models are quite rare and Wayne makes a series of resin cast copies of these models that are hard to get as originals. Upon first glimpse there is nothing remarkable on this model, it is just a freighter in the usual wartime recognition model style. However, if you know a lot of similar ships you might notice that there IS something special. The bridge is looking quite odd- It is turned around. The aft-looking side looks like a reasonable forward side of the bridge and what is facing towards the bow should be looking aft. Wayne makes his copies as one-piece resin-castings, so this turned-around bridge is not his fault. When I drew his attention to the odd-looking bridge, he told me that both of the original South-Salem models he knows (the borrowed one used as master and the one he later acquired for his own collection) looked exactly the same as this one. Closer inspection (ref. 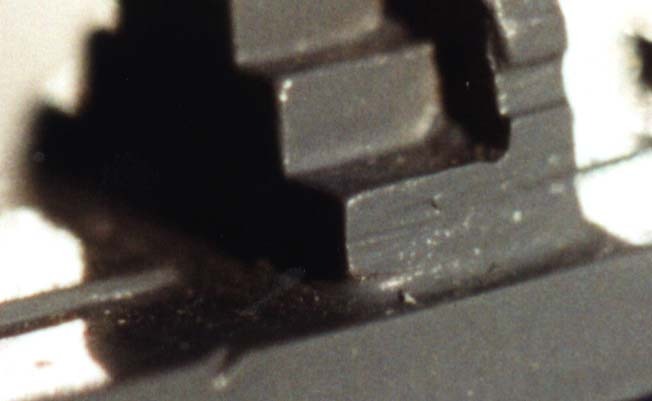 the close-up photos) shows that the bridge shows something like a seam and some surplus glue at the bottom of the bridge. Obviously here were the two pieces fit together. I assumed that these ships were cast in one piece (the same way that Wayne makes his copies today) and didn't know of any reason why this one should be an exception. Shortly after mentioning this article at the warship messageboard we were told the solution for this mystery. Fred Dorris posted it and kindly supplied the following pictures. Fred owns the South Salem set "Merchant Miniature Ships, Mark I" as issued during WWII, dated Feb. 1945. The "Split bridge" is the second from above on the left side. Obviously it has the bridge structure in the proper position. 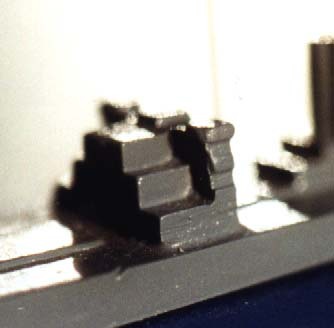 But (as the following picture shows) the bridge is a separate casting which can be removed and turned around as found on Wayne Moyer's model. Sometimes these bridges get loose (as happened with Freds example) and there is some possibility that it may be reassembled wrong. Since both examples Wayne has seen looked undamaged and factory-painted we have to assume that some of these ships were assembled wrongly from the beginning on. It is highly unlikely that Wayne has seen the only two that were assembled wrong at the factory. 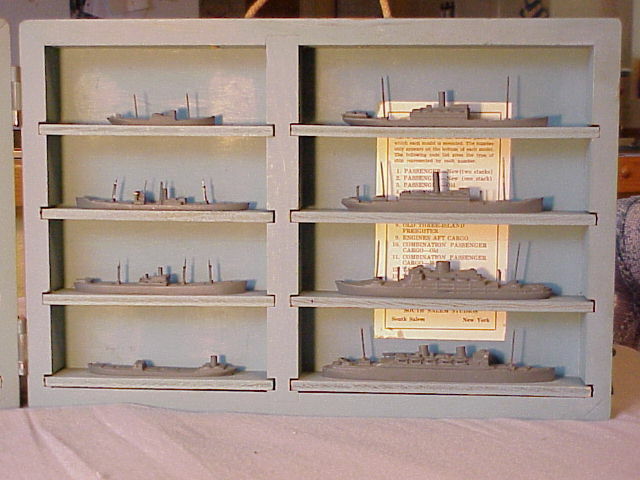 So (due to Freds kind help) we now know that some of these ships were assembled correctly, but certainly a considerably high part was assembled wrong.